Will Astronauts Someday Feast on Poop-Grown Microbes? 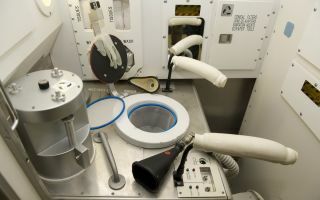 A toilet on the ISS. It's an extreme version of trash into treasure: New research finds that microbes can transform poop into fuel for edible bacteria. "It's a little strange, but the concept would be a little bit like Marmite or Vegemite where you're eating a smear of 'microbial goo,'" lead study author Christopher House, a geoscientist at Penn State who led the study, said in a statement. The study was published in November in the journal Life Sciences in Space Research. More specifically, the researchers used methane from recycled pee and poop to grow Methylococcus capsulatus, a bacterium that is already used on Earth as animal feed. The bacteria grown by House and his team were 52 percent protein and 36 percent fat. The researchers also tested systems designed to prevent the growth of dangerous microbes among the edible bacteria. They created very basic, or alkaline, microbe farms with a pH of 11 on the 14-point scale. In this environment, they were able to grow Halomonas desiderata, a bacterium with 15 percent protein content and 7 percent fat content. It's unclear whether these relatively low levels would make the bacteria unsuitable for food, the researchers wrote. In another experiment, the researchers raised the temperature of their microbe farm to 158 degrees Fahrenheit (70 degrees Celsius) to discourage pathogens and successfully grew the heat-tolerant bacterium Thermus aquaticus. Those microbes were 61 percent protein and 16 percent fat, they found. Over 13 hours, the research team was able to remove between 49 percent and 59 percent of solids from the waste stream, which is faster than traditional waste management, House said. The food production happened quickly, too. "It's faster than growing tomatoes or potatoes," House said. Poop is a problem in space. On the International Space Station, astronaut urine gets filtered and recycled into drinking water, according to NASA, but poop gets jettisoned with other trash to be incinerated in Earth's atmosphere. The foundation Inspiration Mars, which aimed to send a man and a woman on a Mars flyby in January 2018, reportedly planned to use astronaut feces to line the walls of the spacecraft, creating a shield against dangerous cosmic radiation. But funding for Inspiration Mars never materialized, and the foundation's former website is now defunct. The poop-to-microbial-food system still needs fine-tuning before it could work aboard a real spacecraft, House said. The team tested the components separately, but now must come up with a way to integrate them into one system.